I haven’t really been looking for bees yet but I know from BWARS reports many have been active in the south over this mild winter. On Saturday I saw my first 2014 bumble bees and a honey bee here the garden, along with a big bee mimic hoverfly. 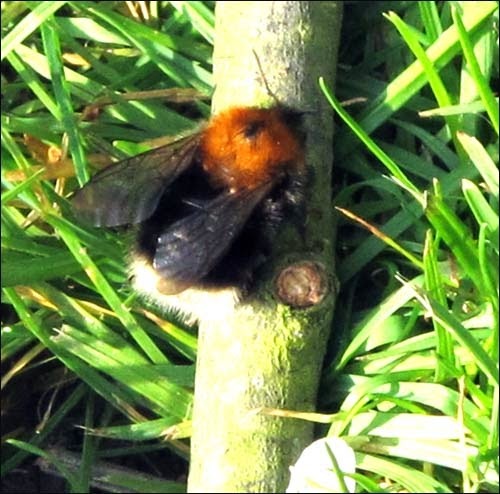 The bumbles were the Buff tailed Bumble Bee, Bombus terrestris and the Early Bumble Bee Bombus pratorum. My bee friendly neighbour has an early clematis and we both have winter honeysuckles and the wild bird cherry is just coming into bloom The bees were busy around them all. We were talking today over the fence. “When I saw the bees were back it just made me smile” she said. Me too Carole! My painting of the big beautiful Bombus terrestris on wonderful bee friendly early Mahonia. The last bee of 2014 was this Bombus terrestris I photographed on Nov 30th on very late flowering comfrey. The comfrey is such a star. It’s so easy? PLANT MORE BEE FRIENDLY FLOWERS!!! It was very depressing to hear of the discovery of yet more new problems for Bumble Bees last week. It has just made me more determined to redouble my efforts this year to help wild bees and promote their conservation. I am just a small scale gardener and the easiest, most effective and cheapest thing that people like us can do is to plant more bee friendly flowers…and goodness, that is easy enough. 1 Bee house clean out, repair, reassemble and restock the solitary bee house with new tubes. Maybe build an extra one…Yes! 2 Order some new bee friendly perennials. Lots of online shops, and garden centres now display the helpful RHS pollinator friendly logo. There are also specialist suppliers. like Bee Happy Plants who I have bought from in the past. 3 Seed checking I am checking my seeds to see what annuals I might need to sow or restock. I save seeds from poppies, phacelia and anything else I can think of that might help. It’s a random business but I end up with lots of seeds which I generally scatter on newly dug bits of the front garden. We are slowly getting rid of the grass out there. 5 Bee Fostering Collecting boxes for possible Bumble Bee fostering. My bee friendly local pest control guy Mathew brought 4 colonies to me last year. He is very VERY reluctant to move Bumble Bees and tries to persuade people they are benign, but some people just don’t listen. Three made it through to a certain extent. One lucorum, one very successful lapidarius and a huge terrestris colony. It was very rewarding. For now if you are dithering about some new plants look for the many online resources and suppliers of Bee Friendly Plants. The RHS’ two PDFs Perfect for Pollinators: Garden Plants and Perfect for Pollinators: Wild Flowers are a good start. More bee encouragement to come… Oh and luckily my Tree Following trees, Willows and Horse Chestnuts, are very good for pollinators!! I also decided my next bee painting will be Bombus Ruderatus the beautiful black version of the Large Garden Bumble Bee which I saw a couple of years ago in Dads garden. I made a sketch at the time but, especially as it is a fairly local species it’s time I made a good study. I don’t know much about these lovely trees yet, except that they are a tree of childhood days; of conkers, sticky buds on nature tables, the magnificent “candles” when in full bloom. “Under the Spreading Chestnut Tree” the children’s chanting rhyme with the accompanying actions. Shade from the summers heat and a nesting tree for big birds. Also a favourite subject in the much loved Ladybird “What to look For in….” books with the lovely illustrations by Tunnicliffe and in the Shell Guides with S. R. Badmin’s quintessentially English paintings. More of these artists in future Chestnut posts. It’s not a native I know, but a magnificent specimen tree for stately homes, parklands and village greens. Although from an economic point of view they are not a very useful tree, they are none the less very beautiful.. so fall well within the “beautiful or useful” category of William Morris. I know that, like many other trees, the Horse Chestnuts are having some problems. In this case they falling prey to the unsightly leaf miner and the more serious bleeding canker. I will learn more about all of this as I go. Initially I need to understand the basics and so I am starting with its shape. I made some quick sketches on my walk. There are several scattered around the village from young to old which is useful. Trees look very different from different angles and are very complex things to draw, but for me sketching is the very best way to see and understand the basic shape. This is perhaps the oldest in the village and the one I can see from the front room of the house. The street light gives some idea of its size. There are two in Church field, in a group of four trees. A glimpse of the reservoir between the trees. Two young trees down the lane one still with its plant stake. I now see that the very long lower branches in the older trees hang elegantly down and curl up. The sticky buds on the ends of the upturning branches are just about to burst. The two horse chestnuts in a group of four trees, one on the right of this sketch and one next to it. This view is with my back to the reservoir looking back to the church, which, minus dragon, is in the background. This is a huge tree which overhangs the road. Its lower branches hang down into the garden behind the fence while the roadside branches I think have been cut back. There were wonderful conkers this year. Coincidentally The Horse Chestnut is a symbol of Kiev. I can only hope that the beautiful flowers to come in the spring will also bring a time of peace and political freedom to its population. It seems the Chestnuts were planted in some respects to spite the poplar loving Russian Emperor Nicholas I.. Trees as subversive and defiant symbols. Wonderful. Over at Printdaily yesterday I wrote about my first Japanese Woodcut made last week at an excellent days workshop with Laura Boswell, learning about cutting and printing the Japanese way. It involved cutting with knives and chisels, inking with watercolour and printing on dampened paper. All completely different from anything I have done before. It has great possibilities and in the right hands is very beautiful. With Laura’s help I made a small print of an adder which will be my next subject for Beautiful Beasts. My first little adder print, three plates and about 4 colours. See more steps on the blog post. I shall be working more with these plates next week. On Beautiful Beasts I have been playing with monoprints, again fairly new to me although I made a few at college years ago on old litho plates, they were less than inspiring but I am loving these small prints using the Silk Road Horse sketch as a starting point. So far I have only used waterbased inks and only black ink.They are made with a mix of trace through and wipe out techniques. There have been many trials and not many successes but they can have a beautiful lithographic feel about them and a surprising sensitivity of line. Hopefully a few more this weekend. These are my favourites so far. My blog friend Lucy over at Loose and Leafy is following a tree this year; seeing how it develops and changes over the year. Lovely idea Lucy. She has invited people to join her and I am definitely in. I am already doing some work on Willows this year and wanted a bit of a contrast so am opting for a Horse Chestnut. It will be a once a month report but a great excuse for some tree sketching and observation. At their best they are magnificent trees in every season. There are several scattered around the village. One I can see from our front window. It’s where the rooks roost and I am very fond of rooks. It will be fascinating exploring these lovely trees. I am rather wondering where the time will come from to do this… but hey...it’s what I love to do so I am sure I will fit it in! It was 11.30 am by the time I arrived at the British Museum on Saturday and by then the museum was busy. So instead of wandering about and fighting with the crowds, I went to the Africa Galleries and very luckily found a bench, opposite this magnificent wooden crocodile. It is part of a beautifully lit display of dance masks, some of them sharks, their cast shadows as descriptive as the objects themselves. The masks are huge. I searched for some photographs to understand more about how they were worn and found these wonderful images from the Riverine Igbo region (Ekpafia, Abua, Ekpeya) taken in the 1930’s by Gwilym Iwan Jones a Welsh photographer and anthropologist. You can see more in his archives here. I then swivelled round on my bench to sketch a few more masks from the case behind me. Everything about these masks interests me, from their construction to their use and symbolism. Some of the materials are beads, some incorporate metals, together with natural fibres, wood and found objects. There is a delightful short video on the British Museum website of children talking about the masks. see it here. I also went back to look at the little stucco Silk Road horse; this time I sketched the figure next to him. And made another quick sketch of the big beautiful glazed ceramic tomb horses with their groom. I was interested in how both images are changed by the addition of the figures, even though the figures are not attached. In the second one the “groom’s” hands look as though they would be holding a rope or reins of some sort but the horses have no halters. There is just an invisible tension between them. I am working on these images over on Beautiful Beasts this week see "Silk Road Horses from the British Museum". In January I resolved to go and sketch somewhere different once a month. I didn’t make it in January, but on Thursday, with Beautiful Beasts and the dragon puppet in mind, I spent a few hours at the British Museum. It is my very favourite place in London and I never leave without finding something new and fabulous. This time the trip was for more for visual research, than sketching for its own sake and I spent a long time just wandering and looking, and then returning to make notes. I made about 20 rough notes of beasts, bits of sculpture, of fabrics and ceramics. I was looking for dragons, found a few, but saw many other bizarre and wonderful creatures too. Dragons, lions, a cat, dogs, horses, a pig, a hen, a fire serpent, a harpy and a frog… from various rooms at the British Museum. The Pegleg Horse, the sketch and my sketch kit. My sketching kit is very simple. One pen, 2 sketchbooks one A5 and one A4 and a water pen which I sometimes use. And then I found some wired crouching lion guards from the Nereid Monument in room 17. One has a disembodied foot, both have missing bottom jaws.. poor things. But my very favourite thing from this trip was a small stucco fragment of a horse being embraced by two disembodied arms, what a beautiful thing it is. Ming-oi, near Shorchuk, 8th-10th C. Stucco with traces of paint. I decided this would be my subject for Beautiful Beasts next week. I returned to the Museum for an hour yesterday and made some more notes which I will post this coming week. I could just take photos but drawing something means you have to spend a long time looking at it. Sometimes the thing turns out not to be as interesting as you had hoped, but often it is through the quiet, slow, observation and drawing that you fall in love with it and find some unexpected beauty. Over at the artist’s twitter group it’s #linefebruary. So this week I have been doing some line sketching. Everywhere are tangles of brambles. There is a place on the path where heaps of long mown meadow grass have been slowly drying and disintegrating. They provide cover for small animals who have burrowed into the heaps and the wind has formed them into swirls. I an rather fascinated by these forms and make this white on black study of one of the heaps. …and thumbnails of bits and pieces. All approx A4. I have put this page in upside down, which makes things even more interesting. They are all based on the reservoir walks so I know exactly what and where they were, although some bear very little resemblance to the place. Perhaps you could say they just have something of the essence of each place, which is often all that an artist really wants to achieve. I love pure black and white. It provides a different view and proposes many different possibilities. Some of the marks can be wonderful if you can let them happen. The Bone Drawings: Beautiful Labyrinth, Something of the Rabbit, Lucy’s Skull and a Tiny Corset. I have spent a very happy week drawing bones for Beautiful Beasts. After sketching and printmaking it’s great to sit down for some concentrated observation. I started off with sketches and then looked for some particular aspect of the bone that appealed to me. Here are the drawings. For more explanations and photos etc click on the titles to go to the Beautiful Beasts blog posts. Under the Skin 2: The Beautiful Labyrinth…. A curious thing, I now know to be a rabbit’s jawbone. Pencil with a stray piece of dry grass. The lovely muntjac skull that my friend Lucy gave me. The last bone. It’s a small upturned skull which was casting a long eloquent shadow, or it’s a tiny corset for a fairy, whichever you prefer. Pencil: 4 x 2 inches. Footbone note : The reproduction of pencil work has always been problematic. It still is. Scanning tends to reflect the shiny dark pencil and lightens the image. It becomes a poor thing in relation to its original, with many mid and light tones missing. It’s fine as a record but when I see fine pencil work on the internet I can appreciate just how good the original must be. A few weeks ago I was delighted to be able to supply some illustrations for the excellent The Land Magazine. Nothing you can argue with there, is there? Perhaps we sometimes forget that without “land” we have nothing. The article I provided the drawings for is Seeds Of Resistance written by Ed Hamer who is a farmer in Devon. The article is a fascinating read and takes you through early seed saving, the history of hybridisation and the political and economic pressures surrounding seed production and the issue of Seed Saving, as well as an insight into the work of the Heritage Seed Library. I am, as you know, a dedicated bee conservationist so seeds, flowers and pollination are always on my mind. I save seed when and where I can and after reading this article and also meeting Peter Brinch and hearing his excellent lecture about Open Pollinated Seeds I am thinking much more about the seeds I buy and where I buy them from. The Real Seed Catalogue is a good place to start. You can read a PDF of the article here or even better subscribe to the magazine! I will return to the general issue of seeds and open pollinated seeds in the summer when I’ll be back to my bees.